Dallas Cowboys owner Jerry Jones wants Dez Bryant to spend his entire career with the team, and anticipates that the disgruntled All-Pro receiver will be at training camp and the regular-season opener. Bryant has not signed his franchise tender that will guarantee him $12.8 million this season. He has indicated his willingness to skip regular-season games without a new long-term deal. "I have no doubt that when we play, if we're still in a franchise situation, I have no doubt that he'll be leading the way against the Giants," Jones said Wednesday. "We just know how competitive Dez is and how much he wants to beat the Giants and how much he wants to support his teammates." Without another deal in place by a July 15 deadline, Bryant would be locked into the $12.8 million salary, and there could be no further negotiations until after the season. 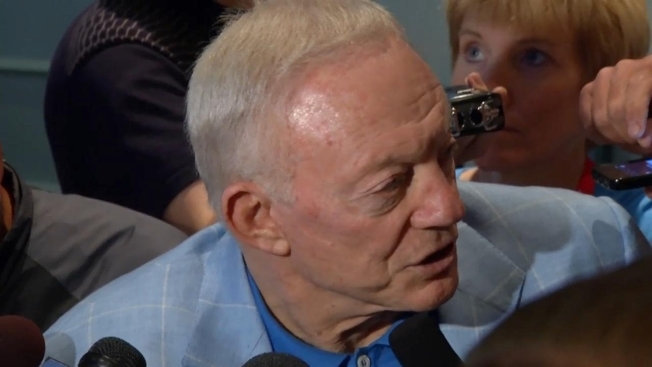 Jones addressed several subjects while speaking to reporters for more than 35 minutes during the Cowboys' minicamp practice at their home stadium. But the primary topic was the absence of Bryant three months before the Sept. 13 opener at home against their NFC East rivals. A day after Bryant's agent Tom Condon told SiriusXM NFL Radio that there have been no talks recently with the team about a new deal, Jones responded, "that's a mistake to think there have not been areas that I could couch and define as negotiations." The Cowboys owner didn't elaborate. In a tweet Wednesday on his verified account, Bryant wrote, "Everybody voicing opinions..13 mil is cool but Where is my security? I'll wait ...5 years without complaining..So how am I selfish? (hashtag)family1"
Asked about Bryant's tweet, Jones said it was very sympathetic and understands completely Bryant's desires. "I would like nothing more than to have long-term security with Dez. Now that's where you get right down to it. We've worked together great for five years," Jones said. "The fact that Dez is where he is, the fact that he's as substantive as he is relatively speaking to the way he came into the league, with the criticism that he was taking, I was taking, is really rewarding. We've got more. There is more ahead. ... But we've got to get it all done to everybody's satisfaction." McFadden "Not Trying to Replace What DeMarco Did Last Year"
Jones, who said he had spoken to the receiver as recently as 10 days earlier, added that Bryant has the chance to be even better in the future. Bryant caught 89 passes for 1,350 yards and an NFL-high 16 touchdowns last season, the end of his rookie deal that paid him about $11.8 million over five years. The former first-round draft pick has had at least 80 catches, 1,000 yards and 10 TDs in three consecutive seasons. If Bryant went through with his threat to skip regular-season games, he would forfeit more than $750,000 for each one he missed under the $12.8 million franchise figure. "I do have a good relationship with Dez. I know that he, like the Cowboys want him to be a Cowboy all of his playing career. We value him," Jones said. "Other than Dez, nobody is prouder of his accomplishments. Nobody took more criticism than I did when we drafted him." Because of rain from Tropical Depression Bill, the Cowboys moved practice from their Valley Ranch facility to the stadium, where Jones watched before taking a seat in one of the field-level clubs there. Jones said he has no indication on when there will be a decision from the league on new defensive end Greg Hardy's appeal of a 10-game suspension for his role in a domestic violence case. On his conversation during practice with Rolando McClain, who had skipped offseason workouts before minicamp while home in Alabama, Jones said he mainly just wanted to see how the linebacker was doing in his rehabilitation from offseason knee surgery. "He feels good about it," Jones said. "Because he's standing and watching this part of the drill, it was just a good chance to have a little visit with him." Along with McClain, Jones expects offensive tackle Doug Free (foot surgery) and cornerback Morris Claiborne (torn patellar tendon in his left knee) to be ready to go when the team reports to training camp in California next month.